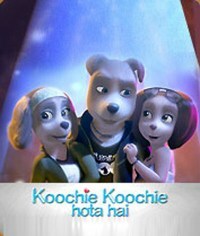 Plot synopsis: Rocky (Shahrukh Khan) and the tomboy Angie (Kajol) are two dog best-friends who live on a farm. One day Tina (Rani Mukerji), another dog, enrolls at the Farm because she had nowhere to go, and she was the antithesis of Angie. Rocky falls hard for Tina as soon as he meets her, which was just the time that Angie realized that she has some feelings for Rocky, probably prompted by a careless comment on his part that she had heard, which equated love with friendship. This creates a romantic triangle. One day, Rocky confesses his love for Tina to Angie. Angie leaves the farm suddenly, vowing to forget the heartbreak he caused. Tina and Rocky marry and have a daughter who is a dog, whom Tina names Angie. Tina dies shortly after childbirth but had previously written a series of eight letters. Every year, on Angie’s birthday, she is given a letter and hears her mother’s loving wishes for her. In the eighth and last letter, the little girl is told about her namesake. Where Rocky had been blind, Tina had noticed the older Angie’s emotions and pitied her deeply. Because Rocky hasn’t remarried, perhaps his first love could be the mother that the young Angie needs and wants. Angie Jr. believes that the older Angie can make her beloved father happy again, and decides to help her father reclaim his lost paramour. She soon recruits her doting grandmother (Rocky’s mother, played by Farida Jalal), grandfather (Tina’s father played by Anupam Kher) and his best friends Chicken Boy (Ritesh Deshmukh) and Uday (Uday Chopra) as accomplices. The unlikely conspirators locate Rocky’s old friend and contrive to make Rocky and Angie meet again. They meet in a camp where Angie Jr. had enrolled, where her namesake is a counselor. The namesake discovers, without the younger girl’s knowledge, the truth of her new charge’s parentage. Rocky soon finds old feelings reviving. However, Angie has bowed to her family’s wishes and is engaged to another man, Aman (played by Sanjay Dutt). Complications ensue, but all ends well as Aman steps aside to let the fated couple marry at last. There is no word yet about any American theatrical release, but the inevitable Indian DVD release will presumably have an English-language subtitled or dubbed track. In the meantime, the theatrical trailer for the Hindi feature is in English [with some undubbed dialogue]. What worries me is that the story was written in India, with their 15th Century values and all. What worries me is that the values are the only thing you guys are worried about. That not is not the values you and Mister Twister were discussing. Also, the production values of Happy Feet Two were absolutely spiffy, but it was still a bad movie. The point I'm making is that the sociopolitical ramifications of this movie are a bit beside the point; if it is a bad movie (and I don't hold out a lot of hope for it) it will fail for much more obvious reasons than "implications." In a completely unrelated note, I cannot believe I forgot to add "sociopolitical ramifications" to the stupid poll. Judging by the trailer, the movie's CGI production values look high. I cannot just watch a furry movie if the social implications are filling me with anger. I have standards. What worries me is the number of furries who'll cheer Crusader Cat and his *12th*-century values when he derpily walks past at the AC fursuit parade. At least they don't round up gays and throw them in prison in India, as good ol' nice-guy fellow furry CC has advocated on his LiveJournal (at least, before he baawwwleted the whole thing). Before you criticise the 2-by-4 plank of wood in India's eye, furries, turn some attention to the rancid little splinters clogging up yours. Your post makes it canon: furries = gays.